Cuốn sách "Sổ tay vận hành lò hơi" của Ken Heselton sẽ rất có ích với các kỹ sư và sinh viên ngành Nhiệt. In the seven years since I finished the first edition of this book I have had several opportunities to think about what else this book could include to give operators more intelligence and tools and therefore better operation of plants. Many ideas were generated by operators asking questions at classes that I teach regularly for operators to comply with regulations of the Maryland Department of the environment. Also, while working with the Testing Subcommittee for the ASME QFO standard and preparing test questions for the operator’s exam I learned much about the perception of boiler operators. As a result there are a few changes in this edition that should be fruitful. I’ve also included guidelines for operation of HRSGs and combined cycle systems because those plants are increasing dramatically with their higher efficiency and the increase in natural gas production. I’ve also grown to understand an increasing need for knowledge about our environment and how our operations affect it. So, there’s more stress in this edition on the environmental effects of boiler operation. Because so many boiler plants include chilled water or can include refrigeration equipment for plant stores, and boiler operators are called upon to operate that equipment, I’ve also included a chapter on refrigeration systems. One section of the chapter addresses the environmental effects of inadvertent and intentional discharges of some of our refrigerants. It does not, however, include all the information that’s essential for passing an examination to achieve EPA certification for air-conditioning and refrigeration technicians in accordance with section 608 of the federal clean air act. There are several short courses available for operators to take for that examination and they are normally accompanied by the exam. 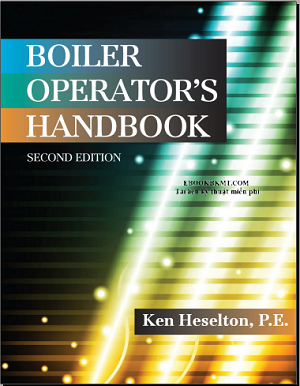 I do hope this new edition will help you better understand the importance of wise operation of boiler plants and associated facilities.